There’s no doubt that preparing for a proposal can be one of the most daunting, yet exciting experiences of your life. Taking the time to purchase the perfect ring for your partner is the ultimate display of affection for them. Bending the knee in a picture-perfect setting and presenting the ring your partner has always dreamed of is a moment that should be cherished forever. So, when it comes to choosing the perfect ring, you want to be absolutely sure you’re making the right choice for your loved one. With our customers’ desire for high-quality products in mind, Banks Lyon are proud to introduce our exclusive new range of engagement rings – the Signature Collection. All rings in the Signature Collection are designed in store by our expert team and manufactured by Charles Green, a British ring and jewellery manufacturer based in Birmingham’s iconic jewellery quarter. With over 180 years of experience in the industry, Charles Green’s team of craftsmen and designers possess a meticulous attention to detail and genuine passion for creating stunning pieces of jewellery for the most special of occasions. 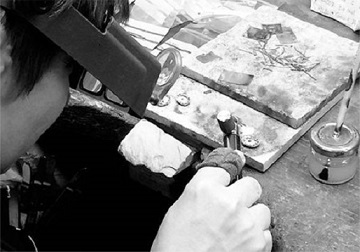 The rings in the Signature Collection take a three-dimensional form in the workshop, where a wax sculpture is created. The main challenge faced by the ring manufacturer at this stage is to maintain the overall symmetry and balance on each and every ring. Once this process is complete, the wax is then melted to produce the ring’s mounting. The next step is very delicate and extremely demanding, as manual work is required to gather the metal components together in order to create the final ring. If the arms of the mounting are too sharp-edged, the whole manufacturing process must be started again. Extra care must be taken throughout this stage of the process as it ensures the longevity of the piece of jewellery for years to come. Following this, each part of the ring is hand-polished prior to the stone setting to ensure a genuinely flawless finish to the whole piece. Once complete, the stone is set, and a final round of polishing allows the craftsmen to erase any small imperfections in the metal to further accentuate the stones’ radiance and beauty. If you’re looking for a ring that will dazzle passers-by, this Platinum 0.31ct Brilliant Cut Diamond Solitaire ring is the perfect piece to adorn the finger of your loved one for a lifetime. The brilliant cut diamond is set in a contemporary four claw setting, which helps to further accentuate its stunning purity. This stone is of excellent quality and comes with a certificate from IGI stating the ring is F colour and SI1 clarity. Available on 0% finance from just £40 per month with a 20% deposit over a term of 48 months, this affordable yet stunning ring is sure to show just how much your partner means to you. 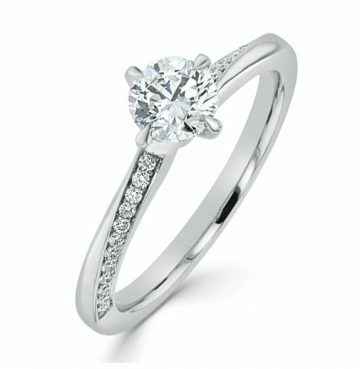 We understand that many individuals prefer one stunning diamond to provide the ‘Wow Factor’ on their engagement ring; with this in mind, we have designed the truly striking Platinum 0.50ct Brilliant Cut Diamond Solitaire Ring with Knife Edge Setting. The beautiful knife edge band will elegantly curve around your partner’s finger, culminating in an outstanding 0.50 carat brilliant cut diamond, certified by GIA as F colour and SI1 clarity. This fantastic diamond is set in smooth talon claws and mounted in polished platinum, leading to a stunningly special piece of jewellery. 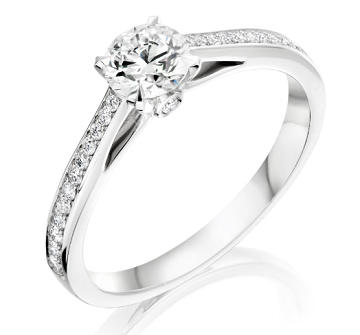 This lovely engagement ring is available on 0% finance from just £49.92 per month with a 20% deposit over 48 months. 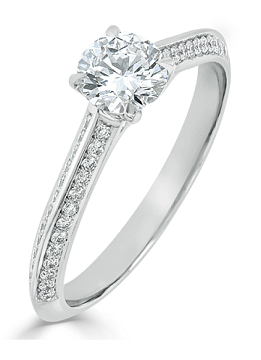 Looking to treat your partner to the most luxurious of engagement rings? 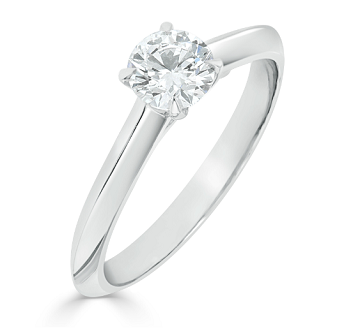 Look no further than our Platinum 0.70ct Brilliant Cut Diamond Solitaire Ring with Knife Edge Diamond Shoulders. This piece of jewellery is luxury personified and boasts two rows of shimmering brilliant cut diamonds (totalling 0.98ct) which are expertly set into a knife edge setting. The 0.70ct brilliant cut diamond, certified by GIA as F colour and SI1 clarity, is set in smooth talon claws to minimise the risk of catching and damaging this truly stunning diamond. We are pleased to offer this one-of-a-kind ring on 0% finance from as little as £103.25 per month with a 20% deposit over terms up to 4 years. When it comes to purchasing the perfect engagement ring, you need to be confident that you have made the correct choice. That’s why it’s vital that you view any potential engagement rings in person and take all the time you need to make the final decision. When trying to be discrete, ring shopping can be a difficult task when browsing in your local area. With that in mind, Banks Lyon are able to whisk you away to your very own private viewing room, so you can explore our extensive range of stunning engagement rings in comfort and privacy. We realise that predicting your other half’s ring size can be difficult, so we are extremely pleased to offer your first re-sizing free of charge on all Signature Collection rings here at Banks Lyon. We also offer this particular collection of diamond rings on finance over terms of up to 4 years with interest-free credit as well. We are also delighted to offer a 10% discount on wedding rings when you purchase an engagement ring with us, along with a lifetime of free ring cleaning and polishing to ensure your ring looks as good as new every single day. If you’re interested in viewing our stunning Signature Collection, please feel free to drop into either our Lancaster or Kendal store, and our team of professional personal shoppers will be more than happy to help.